Inspections by the regulatory authority of ongoing activities at plants during all phases of their development, operation, and decommissioning play a primary role in assuring activities are performed in accordance with governing regulations. Inspections, however, only sample ongoing activities and do not guarantee all activities are properly performed. Effective scheduling and choices of areas to inspect are important in addressing this limitation. Enforcement actions taken when inspections identify inadequate or improper performance can provide incentive for licensed entities to oversee the correct performance of ongoing activities. The regulator may want to periodically assess the effectiveness of the inspection and enforcement programs to determine any need for changes. 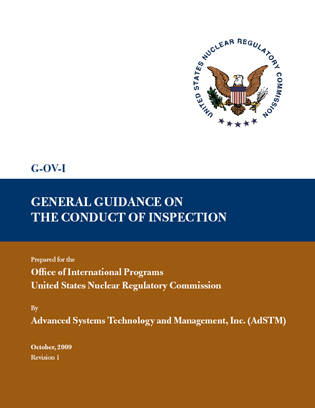 The following discussion provides background on the key areas that comprise the overall subject of inspection and is based on USNRC experience in regulating activities at construction projects and operating plants. References (1) and (2) provide additional insight, and should be used in combination with this document.